The Deroyal Multidex® Gel brings topical nutrients to the wound site to create an ideal environment for the body to heal itself. 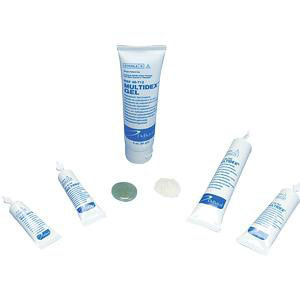 This gel has been specially formulated for the dry or minimally draining wound. It fills wound site quickly and rapidly, mixes with exudates to form a protective coating that maintains moisture balance to protect against dehydration. Deroyal Multidex Gel Maltodextrin Hydrophilic Wound Dressing is non-toxic and not systemically absorbed. Provides moist environment beneficial for granulation tissue growth and epithlial proliferation. Controls odor, decreases the amount of purulent excudate. Effective even in the hardest to heal infected wounds. Even safe for use on diabetic wounds.